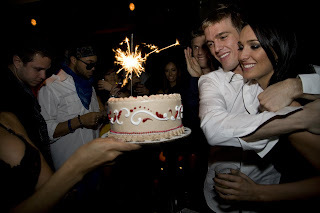 TAO GROUP BLOG TAO NIGHTCLUB LAVO NIGHTCLUB TAO BEACH LAS VEGAS: BACKSTREET BOY NICK CARTER BRINGS AARON AND ANGEL CARTER TO CELEBRATE THEIR 21st BIRTHDAYS! BACKSTREET BOY NICK CARTER BRINGS AARON AND ANGEL CARTER TO CELEBRATE THEIR 21st BIRTHDAYS! Backstreet Boy Nick Carter brought his younger twin siblings Aaron and Angel Carter to Vegas this past weekend to help them celebrate their co 21st Birthdays. The group arrives at TAO on Saturday night and had a private dinner for 15ppl in TAO's Private dining room before heading upstairs to the club. The group chose one of TAO's VIP skyboxes to celebrate in, bringing a cake out for the twins and Nick shoving Aarons gace in the cake! Sunday night the group hit LAVO where they received a special meal from Chef Ludo and danced the night away to the sounds of DJ ROCTAKON in the club upstairs.